But what about the students who lack access to a college or school that fits their needs? Whether it’s a matter of time, convenience, or distance, not all prospective students have the full opportunity to further their education. Two very different states on opposite ends of the country are working to pilot and perfect solutions that can bolster enrollment numbers for community colleges and make higher education available to a larger population. 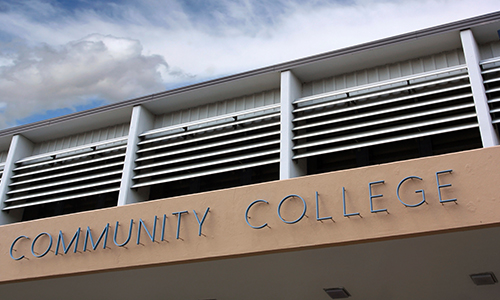 California, a state that spans most of the West Coast, has 114 physical community college campuses. Home to slightly more than 39 million people1 as of 2016, these traditional campuses serve a traditional education population; that is, those students who matriculate directly after high school completion from nearby towns and cities. The two-year community college system has roughly 2.4 million students2, which is a small percentage of the overall population. Hoping to encourage higher enrollment rates in public state schools and offer the opportunity of higher education and training to a larger portion of the state, Governor Jerry Brown wants the community college system to expand its program offerings. Targeting the unemployed and underemployed, Brown hopes that an online-only alternative can attract adult learners and other non-traditional students. California’s two-year education system already has two different, but collaborative online platforms: the Online Education Initiative and the California Virtual Campus. The Online Education Initiative (OEI) is a collaborative program that allows students to register and participate in online courses. It also allows students to find and take online courses that may be unavailable at their home campus. The California Virtual Campus helps students find courses that can be transferable to California State University campuses. Both the OEI and Virtual Campus make use of a traditional college set up, but fold in distance education and online courses as needed to supplement current curriculum or make classes available to a more diverse group of students. For community colleges, incorporating online courses into their standard curriculum allows them to retain or attract students who would otherwise eschew post-secondary schools. Students, then, are able to start on their degree on their schedule, making higher education available to a wider population. California hopes that, with the introduction of an online-only state college, they will be able to entice students who’ve moved away from the state system for out-of-state distance education options like Arizona State University. Similarly, Pennsylvania has piloted a new option for residents who live above Interstate 80 in the Northwestern corner of the state. In that particular area, roughly 9 counties, there isn’t a single public community college. In an effort to keep students in state schools and offer convenient education options to those in more rural areas, Pennsylvania began an experimental alternative in 2012 called the Rural Regional College of Northern Pennsylvania. Officials are pushing for regional accreditation through the Middle States Commission on Higher Education, making this distance education option viable for thousands of students. Unlike a standard online education, Rural Regional will keep the interactive, live aspect of a traditional college experience. Leveraging advances in technology, the school will combine live lectures and interactive courses accessible through television or video. Students enrolled in the program will be taking the same classes as those at a “real” campus, with the ability to interact and ask questions, but from their own homes or chosen study areas. For either distance education model, the benefits are potentially endless for statewide education systems and underserved students. Offering online options, traditional community colleges can expand their reach outside their existing geographical radius, increasing enrollment and revenue over time. Online education also opens the door to a larger, more diverse population. Regionally, giving prospective students the opportunity to enroll in college programs that were previously inaccessible to them can also bolster the economy, providing skills training and job opportunities in in-demand careers. No longer an unattainable goal, diverse students will have the opportunity to gain the knowledge and skills needed to achieve their career goals.